Christmas preparations have well and truly started in my household. The decorations went up yesterday and little man and I spent the afternoon making cranberry mince meat, ready to put into pies tomorrow. 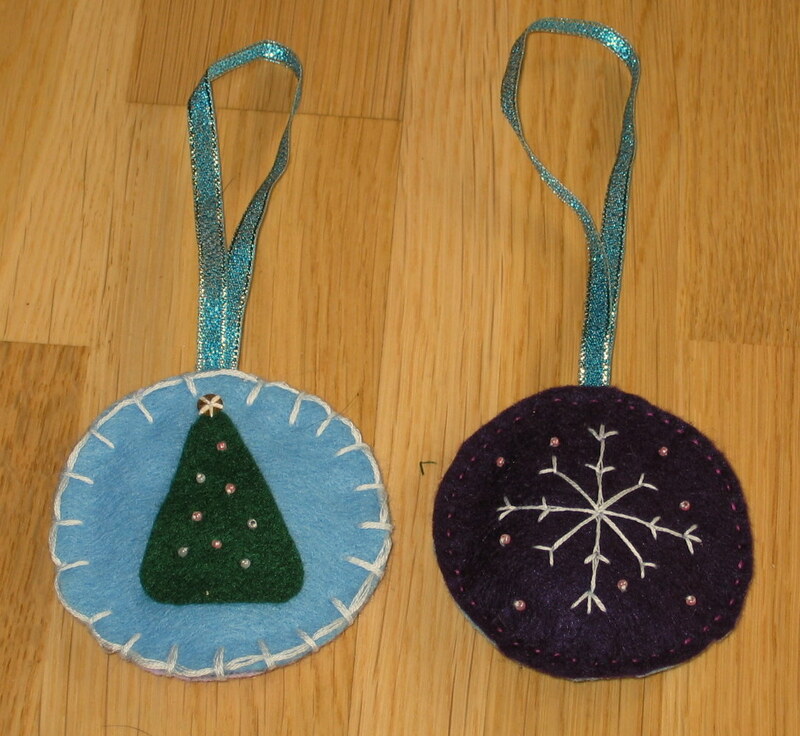 I’ve been a busy little squirrel making those last minute things (check out my sweet button earrings) With Just over a week to go, I thought I would share a couple of easy to make felt decorations, for those of you that want a welcome distraction from seasonal stresses (sewing can be very relaxing!). 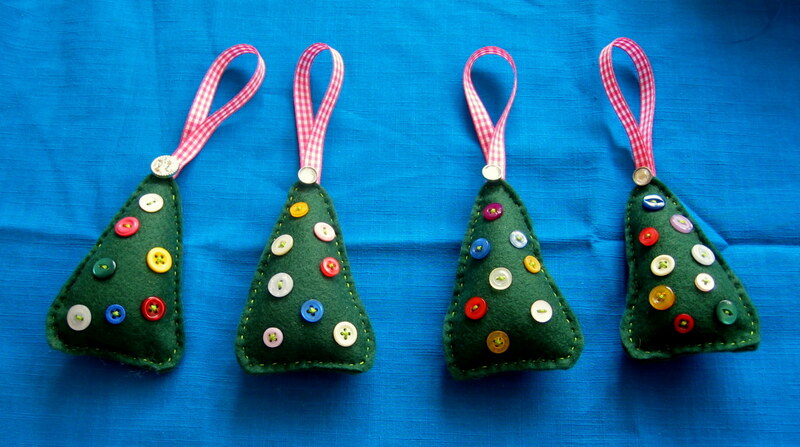 These little Christmas trees are really quick and easy to make, and they are made of scraps. I am a bit of a hoarder if I’m honest and the sight of a jar full of buttons for £1 in a charity shop or at a car boot, makes me really excited (they are like little treasure boxes aren’t they?). I use buttons in a lot of my projects but the teeny tiny ones always seem to get put back in the jar and left on the shelf. Well no more! They are the perfect size for these Christmas Trees. How to make: Take scraps of felt (the edges don’t fray so you can cut away, hassle free) and cut into rough triangles. Make sure that you have 2 the same shape and size for each tree (one for the front and one for the back). On the front piece of felt sew some small buttons. Place the front and the back pieces wrong sides together (or as the photo shows) and just sew round using a running stitch. When you get to the top, sew in a scrap of ribbon (or string). If you want to, you can add a little stuffing to give it more shape. If you want to do this, add it just before you finish sewing it up. I used a light green thread to sew with as I wanted to see the stitches (gives it a more ‘homemade’ feel). These two, I made a couple of years ago (in an earlier post, I claimed that the earrings were my first attempt at blanket stitch……I completely forgot about this little thing, although looking at it I’m not sure you can really call it a successful blanket stitch!). These were really simple to make. Again they are made from scraps of felt and ribbon. The Christmas tree is glued on (if you do anything like this, remember to sew the tiny beads on first as sewing through dried glue is really hard). The snow flake is a blanket stitch. I drew the design straight onto the felt and sewed over it (use a tailors chalk that comes off). Again I used a running stitch around the snow flake and put a little stuffing in it. The Christmas tree one, I tried to do a blanket stitch and didn’t use any stuffing, so it lies a little flatter. To be honest, if I did it again, I would use a little stuffing and would probably use running stitch round the edge instead of blanket stitch. Anyway, that’s enough from me at the moment. I’m off to put my feet up for a bit.